Each of these concepts has been around for a long time. This book combines them to form a powerful new model that revolutionizes the way we think about the world and our place in it. Tom Blaschko earned a Bachelor's degree in astronomy from the California Institute of Technology, where he learned something about science. He earned a Master's degree in developmental psychology from the State University of New York at Buffalo, where he learned several seemingly contradictory things about the inner workings of people. He earned a third degree black belt in Shotokan Karate, where he learned about the martial arts aspects of the life force called ki. He has been interested in paranormal phenomena since grade school and went on his first (unsuccessful) ghost hunt in the 1970s. Scientific influences include research by Rupert Sheldrake on morphic fields, Ian Stevenson's studies of people who remember past lives, analysis of the effects of Emotional Freedom Techniques and other energy healing, and research on ki by Kuo Kanshin and Shigeru Egami's group. Beyond the scientific research there are thousands of stories from seemingly credible people who have talked with angels or fairy folk or apus or djinn, seen ghosts, and lived in Dreamtime. Rather than discredit these reports, Tom asked the question: What needs to be added to Western science to make these observations possible? The answer was a two-item list: souls with chakras and a fifth force called the life force. Both of these are accepted in many cultures, so nothing new was needed. I've worked as a Subconscious Healer for over two decades. I've been able to help people overcome all sorts of suffering (including cancer and other physical diseases) by using subtle (and not so subtle) Life Force energies. The journey has been amazing and miraculous at times. However, I've always been on the fringe; a perpetual outsider. There have been times of great self-doubt, loneliness, and depression. I was often asked "Is there any science to back up what you do?" It was always an awkward question I didn't quite know how to handle. Not any more...Tom Blaschko's book, Calculating Soul Connections, brilliantly explains the science behind what I've been doing for the past 20 years. It's such a relief to see substantial scientific theory applied to the mysteries of spirituality. Tom has taken scientific theory where it belongs...outside of the box! 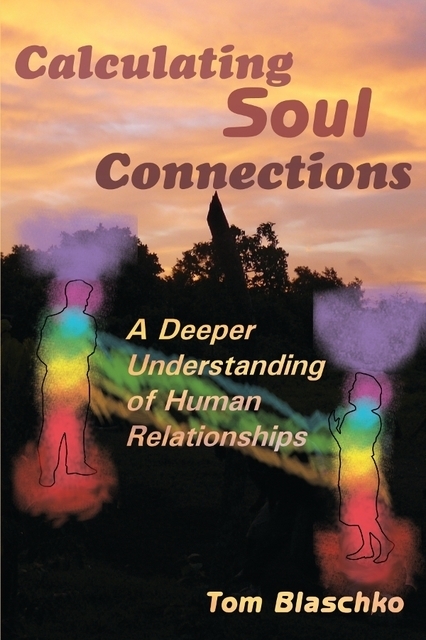 In Calculating Soul Connections Tom Blaschko has systematically mapped out and explained the underlying dynamics of how our energy bodies function in relation to our soul's experience. He has taken care of the heavy lifting by providing us with a methodology that is both thorough and open-ended -- creating new opportunities to play around in the energetic realm. Tom has succeeded in making a complex system accessible and easy to understand -- even for the nonscientist. I highly recommend this book to anyone with a serious interest in understanding the luminous body. Well done! As a practicing psychotherapist, I have found that Tom Blaschko's book illuminates the interactions between persons. I especially value his creative exploration of the deep soul connections that occur through our seven chakras. I recommend the book to everyone interested in deepening their understanding of how humans affect one another.